Twenty-one years after her political party, the National League for Democracy (NLD), swept the elections in the country then known as Burma, Aung San Suu Kyi is moving a few steps closer to power. While she won those elections, she wasn’t allowed to form government—she was jailed, and has spent the bulk of the last two decades in prison or under house arrest. She has stood firm: her unrelenting gaze, unflinching commitment to non-violence, and dignified obstinacy have finally forced the generals to devise a face-saving way in which she can take part in elections and, they hope, they can retain power in some form. The road ahead remains treacherous. While the generals have stepped aside and a nominally civilian government rules, and now they have promised by-elections under amended rules, which allow her to stand for elections, doubts remain. The generals aren’t really stepping aside; they haven’t appointed an independent commission to oversee elections. They haven’t released all political prisoners. The man who calls himself Myanmar’s president is a former general. True, some 200 political prisoners, including the comedian and writer Zarganar, have been freed, but perhaps nine times as many remain in jail. Citing environmental concerns, the government has stopped a Chinese firm from building a dam, but more Chinese-built dams are being planned. Remember, too, that this is a government that didn’t want the international community to help when Cyclone Nargis devastated the country; this is the regime whose soldiers had no problem beating up peaceful monks protesting against military rule. As for the elections, only about 50 seats will be contested of 664, and even if the NLD wins every seat, it will have only a small voice in the parliament. These are gestures, not reforms, without relevant changes in the constitution or laws. People’s rights are being presented as privileges the generals have granted. This is the time when India should appear on the right side of history. Its inevitable rival in the region, China, has invested heavily in the generals. India not only used to allow the Burmese opposition to broadcast from India, in 1993, (albeit after Suu Kyi’s Nobel Prize) it honoured her with the Jawaharlal Nehru Award for International Understanding. She has lived in exile in India in the past. In her book, Freedom from Fear, she has written eloquently about colonial-era exchange of ideas between freedom fighters of Burma and India, united in an anti-colonial struggle against the British rule. India has dropped the ball since, in pursuit of resources, and in return, the generals promised to withdraw any sanctuary on their soil for extremist groups in the Indian north-east. But India can’t outdo China in showering affection on dictators; it should side with the kind of leaders it understands. The international community can’t wait to get a piece of the action. Myanmar has abundant labour supply, vast forest wealth, and promising gas discoveries. Sustained campaigning by human rights groups has targeted companies that have tried to do business with the generals. Many businesses have left, or avoided, Myanmar, only to see companies from Thailand, China, India and other Asian countries establishing their presence. Myanmar’s generals have yielded little to public criticism over the years, clinging to power, exasperating some interlocutors. 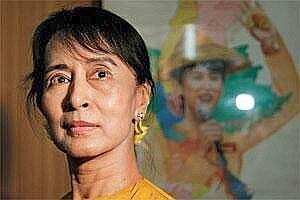 Others have appealed to Suu Kyi to compromise and relent for the sake of Myanmar’s poor, as though she is responsible for their poverty. Some of her former party members have broken with her, arguing for trade and investment to revive the economy. But Suu Kyi has been the victim here, even if she is an adversary of the generals; to cast her in the role of someone equally responsible for Myanmar’s plight is dishonest and disingenuous. The generals are betting that even if the NLD wins all 50 seats, with over 600 pro-government legislators in the House, they will heavily outnumber the NLD. The generals want to showcase Suu Kyi’s presence in the parliament as an example of a “new" Myanmar, a functioning democracy, without ceding power to her. Their model appears to be Gen. Suharto’s Indonesia, when the parliament reserved seats for the Angkatan Bersenjata Republik Indonesia, as the armed forces were then known, and token seats were available for opposition parties to contest against the might of the ruling Golkar Party. The generals hope to create a similar illusion of representative democracy. But as Suharto learnt in Jakarta, as Mikhail Gorbachev foresaw happening when he unleashed glasnost (openness) and perestroika (restructuring) in the Soviet Union, and as F.W. de Klerk realized what the end game would be when he sat down to negotiate with Nelson Mandela in South Africa, there is usually no turning back.